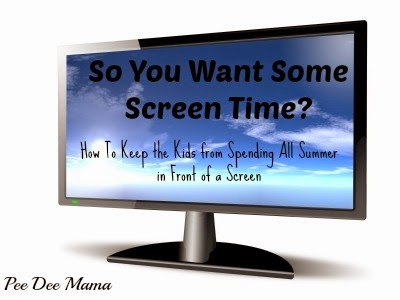 Tales of a Pee Dee Mama: So You Want Some Screen Time? So You Want Some Screen Time? We started summer vacation last week. In past summers, the small people spent (or wanted to spend) far too much time in front of a screen - computer screen, television screen, video game screen, etc. I don't want that to be the case this summer. I would rather they spend the majority of their free time outside, reading, helping around the house, etc., so I came up with a screen time policy that will hopefully help with this. In order to have screen time, the small people have to earn it. I came up with a list of activities that would earn points toward time in front of a screen. 30 points = 30 minutes. Today was the first day we've used the points system, and so far it seems to be working. The Boy, who usually doesn't read without it being assigned for school, spent 2 1/2 hours reading this morning. Can You Hear My Heart Breaking?